Below are the official 2018 Hockomock League Girls Outdoor Track All Stars, selected by the coaches in the league. Attleboro, 77 @ Durfee, 59 – Final – Attleboro junior Dom Victor dropped a career-high 18 points while hauling in eight rebounds to lead the Bombardiers to a win on the road. Sophomore Bryant Ciccio also added a career-high with 17 points while senior Elvin Sam added 15 points and junior Mason Houle finished with 12 points. Canton, 62 @ Archbishop Williams, 57 – Final – Click here for a recap of this game. Franklin, 74 vs. Catholic Memorial, 60 – Final – Click here for a recap of this game. Attleboro, 69 vs. Durfee, 57 – Final – Despite 31 points from Durfee’s Shaelyn Correiro, Attleboro pulled out a double-digit win to move back above .500 on the season. Sam Pierce had a double-double with 20 points and 11 rebounds to lead Attleboro, while Nyah Thomas added 13 points, MacKenzie Roberts had 12, and Liv McCall had 11 in the win. Attleboro coach Marty Crowley said that Jordyn Lako was “immense defensively” for the Bombardiers. Mansfield, 46 @ Bishop Feehan, 61 – Final – Ann Maher scored a team-high 17 points and Meg Hill added 15 for the Hornets, which split the season series with the Shamrocks. Maggie Danehy also scored eight points in the loss. Oliver Ames, 0 @ Canton, 5 – Final – Click here for a recap of this game. Stoughton, 0 @ Mansfield, 9 – Final – Mansfield scored three goals in the opening period and added four more in the second period. Tim Arnold had a pair of goals for the Hornets while Nick Levine, Matt Copponi, and Coleman Jenkins each scored their first career goals. Nick Menz recorded a shutout in the third period for the Hornets. North Attleboro, 7 @ Taunton, 4 – Final – North Attleboro’s first line was at its best, scoring all seven of the Rocketeers’ goals in a win over Taunton. Anthony Zamiello scored a hat trick while Jason McNeany and Drew Wissler each scored a pair of goals for North. Canton, 2 @ Franklin, 0 – Final – Click here for a recap and photo gallery from this game. Foxboro, 8 @ North Attleboro, 57 – Final – Click here for a Photo Gallery from this meet. Taunton, 12 @ Oliver Ames, 59 – Final – Oliver Ames junior Anthony Berksza picked up his 15th win of the season to help the Tigers defeat Taunton. Taunton’s Woudanly Danger (220) and Mason Frank (285) picked up wins for the visiting Tigers. Canton, 34 vs. Milford, 65 – Final – Canton’s Cordel Smith won a pair of events, taking first in the 300M (38.66) and qualifying for states in the high jump (5-10.00). Cam Sanchez crossed first in the 55M dash (6.99) while Jack Healey took second in both the 1 Mile (5:07.15) and the 2 Mile (11:05.91). Riley McDonnell placed second in the 300M (38.70). 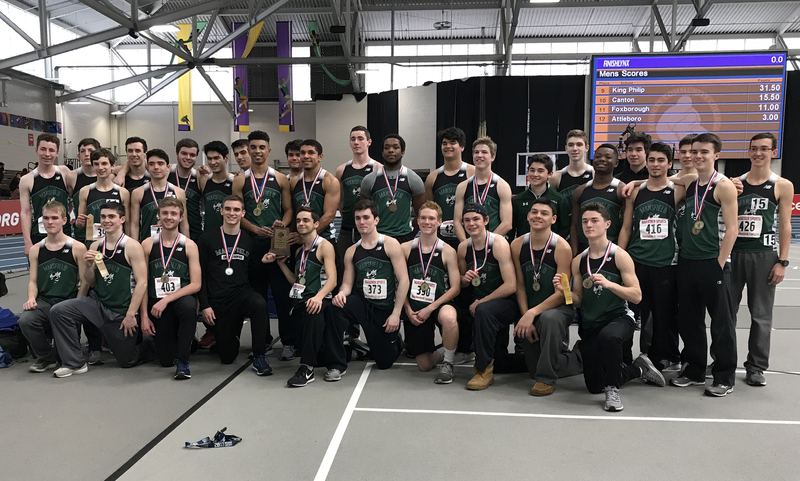 Mansfield, 66 vs. Oliver Ames, 34 – Final – Mansfield swept the points in the 1000M with Kevin Crawford taking first (2:43.68), Jackson Murphy placing second (2:50.43) and Sean Lanzillo coming in third (2:51.51). Nick Horn (37.77) and Dan Knight (39.11) took first and second in the 300M for the Hornets while Jareme DiLorenzo (8.17) and Matt Buiser (9.12) were first and second in the 55M hurdles. Canton, 24 vs. Milford, 75 – Final – Canton’s Chloe Pennacchio was a double winner, taking first in the 1 Mile (6:07.08) and the 1000M (3:33.09). Bronwyn Mahoney also placed first for the Bulldogs, winning the shot put (29-04.00). Mansfield, 49 vs. Oliver Ames, 51 – Final – Oliver Ames pulled out a narrow win over Mansfield on Wednesday afternoon. Mansfield’s Amanda Mangano was first in the 55M dash (7.59) and the long jump (16-11.00) while taking third in the high jump (4-8.00). Alexis Kiyanda won her first race of the year, crossing first in the 300M at 45.61. The Hornets’ 4×200 relay of Gabrielle Devlin, Julia Harrison, Angela Corkery, and Meg Kuras ran a season-best time of 1:53.42 for the win. 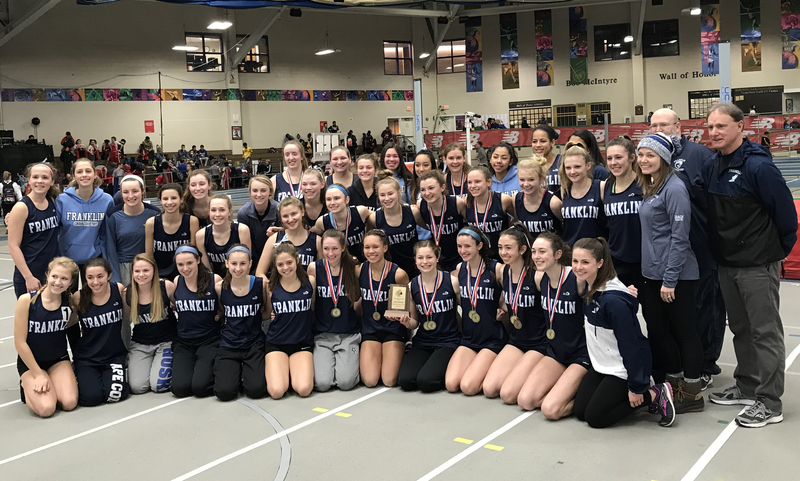 Sharon, 121.45 @ Franklin, 128.40 – Final – Franklin junior Mia Lizotte won the all-around for the second straight meet, earning a 34.7 to edge out Sharon’s Ariana Chabot (30.9). Franklin junior Sadie Rondeau placed first on the beam for the Panthers with an 8.35 while freshman Lexi Lupien took second in each the vault, beam, and floor.